In one simple phrase, the US equivalent of Alan Sugar had galvanised a decisive section of the American public like no other political slogan ever had. As the Obama era, with all its hopes and dreams drew to a close, ‘Make America Great Again’ powerfully made a promise to a vociferous, empowered contingent, inflamed some of the worst civil unrest the USA has seen for decades – and played a crucial role in delivering the presidency to Donald Trump. Two years later, President Trump is half-way through his first (and possibly last) term as the domestic and international leader of the world’s biggest economy – and the time has come to re-evaluate the MAGA promise and draw some key lessons. ‘Make America Great Again’ is a phrase that invites analysis from all angles – political, social, psychological, historical and more. But what does MAGA mean from the holistic perspective of storytelling? What can business leaders take from this extraordinary example of storytelling and leadership, and apply positively to their own circumstances? How can business leaders win the hearts and minds of their own people – at the same time as scrupulously leading towards a positive future for all? Let’s start with the words themselves – what part does each word play, and what is it about these words that make it such a powerful rallying cry? Lesson 1: Give your rallying cry a simple and empowering verb. ‘Make’ – it’s interesting to note that the phrase does not start with ‘Let’s’ (more on that later). Instead, the phrase is a powerful directive to the individual: emboldening rather than unifying. Every individual has a role to play in this rallying cry, and that’s very empowering. So the verb selection is excellent – it tells people what they need to DO, and this is an essential element for any business rallying cry. When considering your own rallying cry, you need to ask yourself: what is the simple verb that essentially describes what we want people to do? Lesson 2: Identify the one or two stories that really define your business and refer directly to them. ‘America’– this puts the whole phrase in a powerful, patriotic context. It’s a word that has been shown time and time again to resonate with Americans in a way that far exceeds the way British people respond to the word ‘Britain’. Consider how many films have the word ‘America’ or ‘American’ in them… and in contrast, how many films that feature any other nation in the title. The word ‘America’ represents an entire mythology – and referring back to this is incredibly powerful storytelling. While using ‘America’ in any title has widely become a shortcut to interest and engagement in the USA, for businesses it’s much more a case of a listening exercise to identify what their own ‘origin myths’ are. Effectively, every business has its own language and stories from the past – stories that are meaningful to those that work there, and take on bigger, iconic meaning. Simply put, it’s critical for business leaders to use the language and stories of their own people in communications. America wasn’t Trump’s story – it was the American people’s. 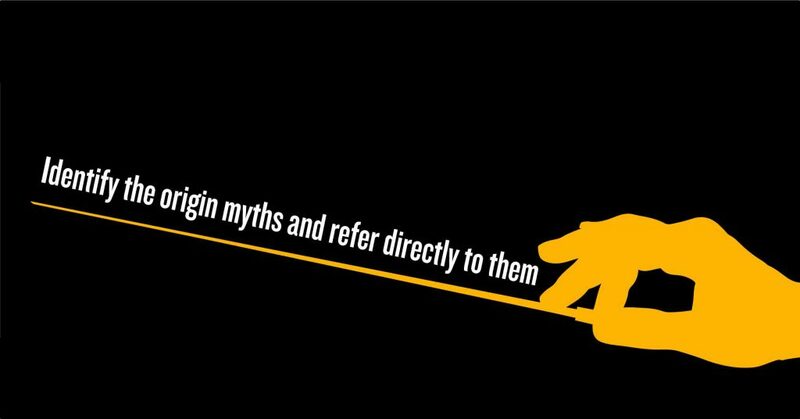 What’s are your business’s’ origin myths? Find them and use the same language in your rallying cry. Lesson 3: Set out an ambitious vision that doesn’t undercut where we are today. 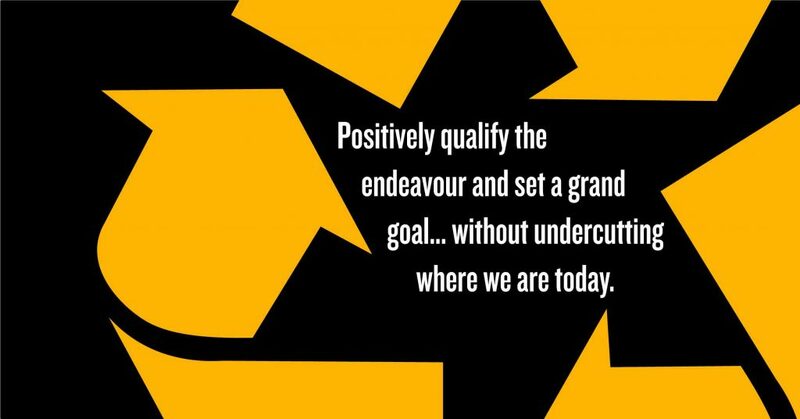 ‘Great’– the qualifier that sets the required goal. Necessarily vague (but usefully having the double meaning of both ‘excellent’ and ‘large’) and again, a simple, memorable word that keeps the syntax tight. For businesses, getting this qualifier right is so important – it goes to the specific kind of ‘good’ that is sought, and inherently reveals the perception of where we are now. More often than not, the qualifier needs to reflect positively on where we are today, as well as speaking confidently to the heights we can reach tomorrow. As a business leader, if you’re going to include any negative element in your rallying cry (whether implicit or explicit), it’s so important to be thoroughly honest, clear and frank about any shortcomings that need to be addressed. By using the word ‘Great’ with all it’s negative implications in such an unqualified way, Trump implied that America was not good enough without speaking to the measurable change that was needed. One can see today’s unrest as a direct consequence from this. Shrewd electioneering – terrible leadership. 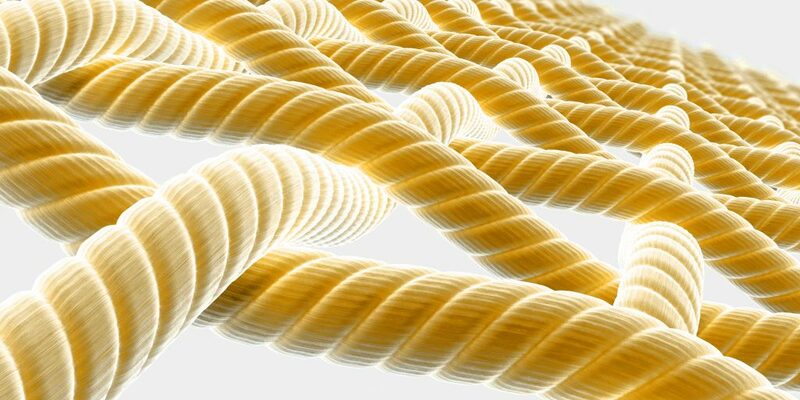 Qualify ‘what good looks like’ – and where there is a need to be critical, be utterly honest, transparent, and measurable about what the change looks like. Lesson 4: The rallying cry must speak simply to the journey that a business is on. ‘Again’– the most important and contentious word of the four. In terms of storytelling, this goes directly to one of the most powerful archetypal journeys: rebirth. Positioning his campaign as the resurrection of a better America, Trump aligned his candidacy with a narrative that spoke of returning to a better time. By consistently aligning his rhetoric around this simple, primal narrative, and condensing that narrative down to just four words, Trump powerfully used the principles of storytelling to audacious effect. He set out a journey for America to go on – and MAGA spoke directly to that journey. The rebirth archetype is a powerful narrative that has precedent in the political sphere. Consider the memorable title of Nelson Mandela’s autobiography: ‘Long Walk to Freedom’. These words encapsulate the dramatic story of Mandela’s story: the years in prison, the return to the outside world, and his quest to unite South Africa in freedom. Not only was it a story that grabbed the attention of the entire world, it remains one of the best-known political biographies – the fact that those four words speak so clearly to the rebirth narrative is surely one of the reasons why. The key difference between Mandela’s resurrection narrative and Trump’s is that while Mandela’s subsequent leadership fully focused on taking a divided country to a happier and more united time for all, Trump’s leadership has focused almost wholly on using existing divisions for political gain. There is still time for Trump to turn things around – but as things stand, it’s difficult to envisage a better America post-Trump, and all too easy to imagine one that is actually worse as a result of his leadership. 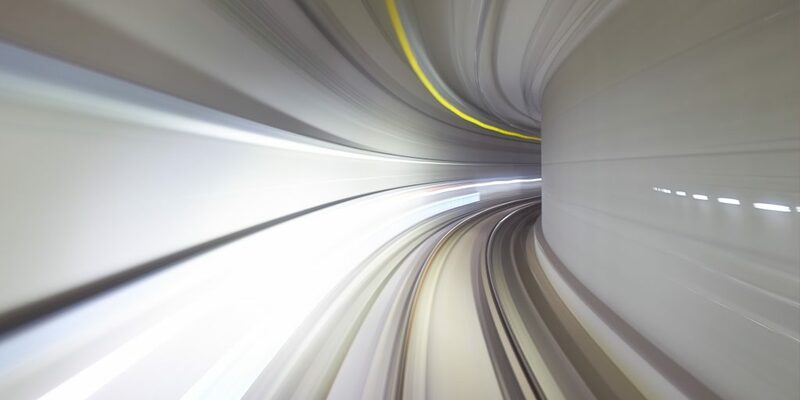 Defining the journey that your business is on is an essential part of business leadership. Understanding how this fits to the basic archetypal stories that feature again and again in human life and art is critical to how leaders speak clearly, confidently and concisely to the big shifts that need to happen to achieve success. 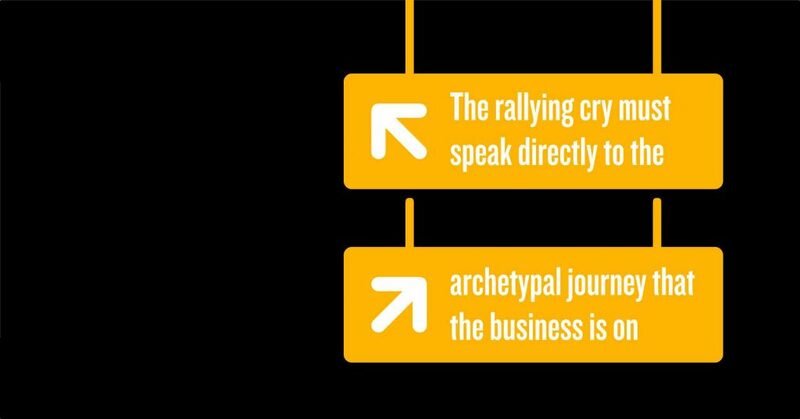 When defining your own rallying cry, consider: what is the essential journey that our business is on, and how can we speak to this directly in our rallying cry? So Trump apparently uncovered a magical combination of words that spoke to the American people. But here’s the scoop: as a political slogan, ‘Make America Great Again’ is not new or original. Ronald Reagan used the same words as his official 1980 presidential campaign slogan, albeit with an inclusive ‘Let’s’ at the beginning. Even Bill Clinton used the phrase in a 1992 speech – so this certainly wasn’t a lesson in creativity from Trump. The phrase was already out there. In terms of winning the election (interference and other subterfuge aside), the key difference was that Trump really tapped into a key dominant narrative in American culture. Namely, the swathes of white, lower-class Americans who had been bottling up disgruntlement, disenfranchisement and disaffection over many, many years. No-one had truly spoken about this narrative, or to it – but Trump and his team recognised this, and were able to communicate in a way that truly tapped into what for many people was an unspoken truth. When we help our clients define their own rallying cries, it’s so important to really understand where their business is today. 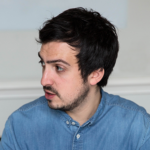 It’s one thing to define a strategic narrative and create a slogan that matches it – but it’s only by speaking to the current mood in the business that storytelling can generate renewed engagement and action. 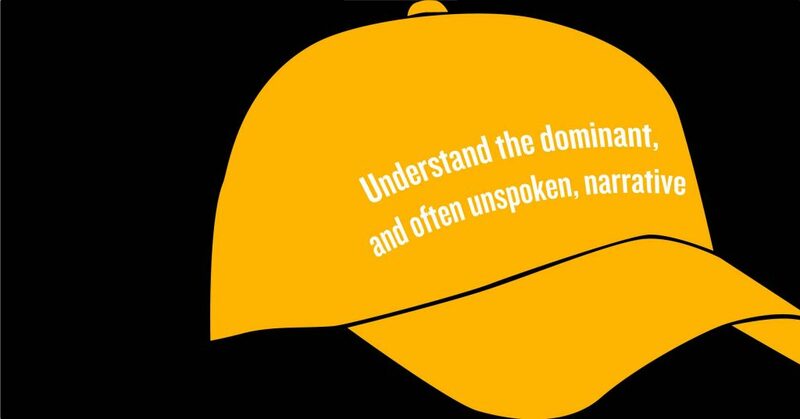 So the question is: what is the dominant, unspoken narrative in your business, today? 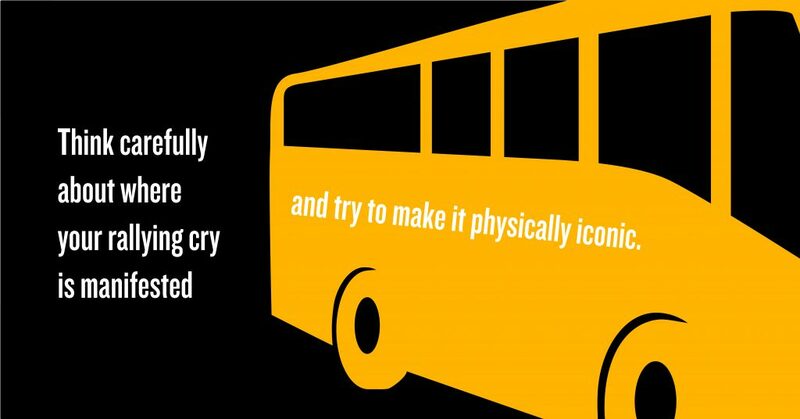 Lesson 6: Think carefully about where your rallying cry is manifested – and try to make it physically iconic. So far, we’ve just discussed MAGA in terms of the words themselves, the historical context, and how Trump deliberately created a powerful narrative that those words directly spoke to. 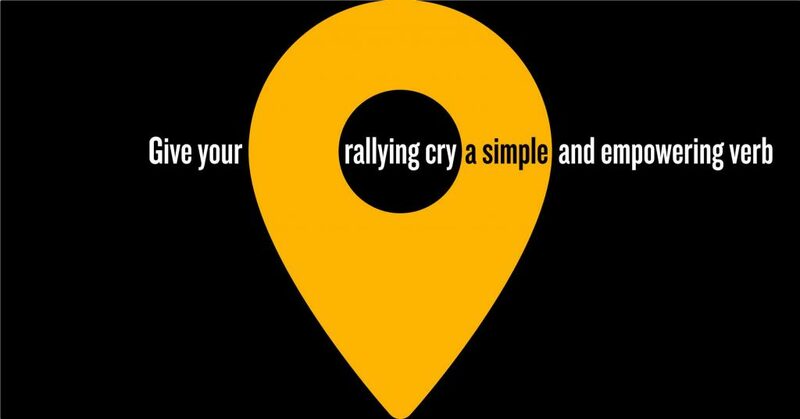 But when it comes to designing a successful rallying cry, thinking about the physical space in which the slogan is manifested is just as important. Purely in political terms, the MAGA baseball cap was a stroke of genius. Wearable, clearly identifiable with the Republican party, pointing to an everyman image, cheap to reproduce and purchase… and worn with formidable frequency by Trump himself. The MAGA cap has become a divisive icon of all that Trump represents, but from a design perspective it’s simply brilliant. There’s a very simple lesson for businesses here: it’s not enough to just have the words of a rallying cry. It’s not enough to use them on printed materials or at one-off events. So often, businesses overlook the power of ambient design – any campaign must champion and celebrate the central messages, and making sure that this happens in physical space is another essential lesson from the MAGA campaign. Where are the physical spaces in your own business – and how can you bring the story to them, and make it alive in their day to day? MAGA was undoubtedly a successful campaign. When it came to making a rallying cry successful, Trump and his team overachieved, scoring a result that few political experts thought possible. When it comes to businesses coming up with their own rallying cries, there is clearly a lot that can be learned here about how to engage large and diverse populations in a movement for change. But the divisiveness of Trump’s leadership raises serious questions about how storytelling ought to be used. We are widely held to be living in the post-truth age, and Trump with his MAGA cap is undoubtedly the poster boy of this. So, is it even ok to use rallying cries any more, and use the power of storytelling to engage people? Firstly, the fact of the matter is that America generally does not feel that Trump is making it great again. Trump’s approval ratings are the lowest of any US President post WWII, and that is something that no amount of campaigning or catchy slogans can hide. It’s all well and good making promises, but what we currently see is a President holding back a very large tide of reality. Storytelling can help you be a more compelling, engaging and clear leader – but it cannot and should not ever be used to pull the wool over people’s eyes. As a business leader, use storytelling and strategic narratives as a sincere, honest opportunity to progressively unite a leadership team behind a positive vision of the future – not to mask failures and inadequacies. Lesson 8: Storytelling is the most important tool for empathy we have – let’s not degrade it. The final lesson is perhaps the most important one, and where we need to be more emphatic than ever. All around the world, leaders have a responsibility to use the power of storytelling towards a better future. From bedtime stories to Netflix box sets, stories are how we interpret the world, make sense of it, and take our cues for how to behave in it. 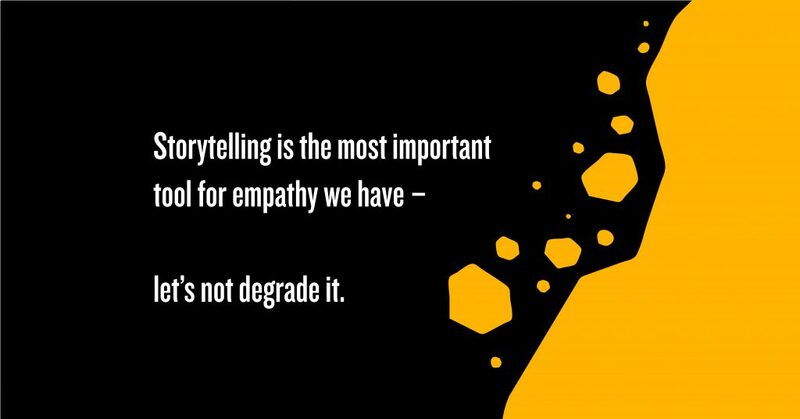 Above all, it’s the most important tool for empathy that we have – and as we collectively navigate a world of increasingly complex challenges, we need storytelling more than ever to help us relate to each other across strange new boundaries. However, it was clear from Trump’s narrative that the new America he promised was not for everyone – and this wretched worldview has been borne out in his post-election decision-making and rhetoric. He may have got the technical aspects of storytelling and a good rallying cry spot on – but his words have deliberately appealed to a latent bigotry, racism and fear in America, and this was purely for personal and political gain. As we look back on two years of utter chaos, hate and fear, it’s impossible to conclude that Trump has delivered, as a leader, on those promises. As business leaders, it’s so important to inspire without overreaching. Finding that happy medium is a challenge – but here at The Storytellers, it’s one we’re used to. By defining an agreed strategic narrative, ensuring that the human value of the story is loud and clear, and creating a rallying cry that is both inspiring AND real, these are pitfalls that can be avoided. Ultimately, storytelling is an enormously powerful way to engage hearts and minds. The potential that a deftly created narrative and a well-chosen rallying cry have to create real change on a mass scale continues to surprise the world – but there is a science to this that can be learned. 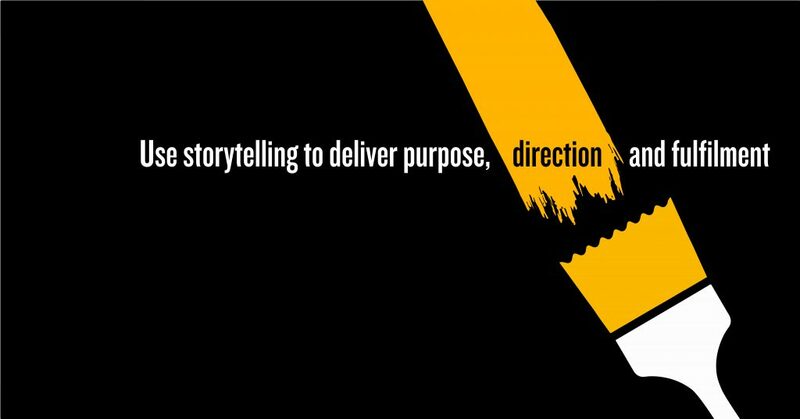 At The Storytellers, we are well aware of this power, and work closely with business leaders to define strategic narratives, rallying cries and powerful campaigns that engage whole organisations and make better leaders. 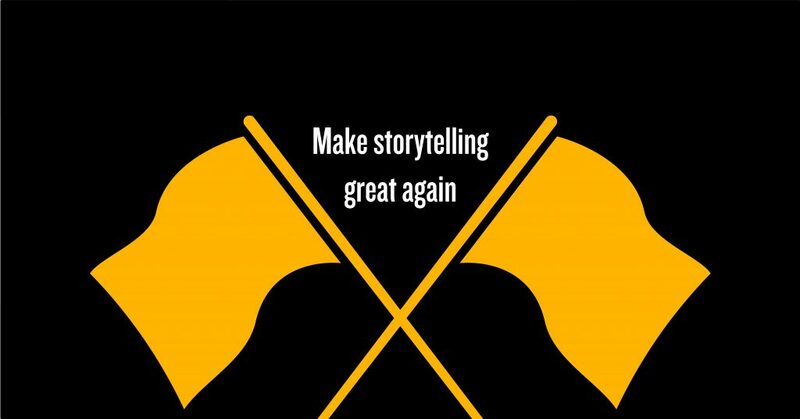 By seeing storytelling as the perfect alchemy of logos, pathos and ethos, and by accepting our responsibilities as leaders in this, we truly can make storytelling great again.